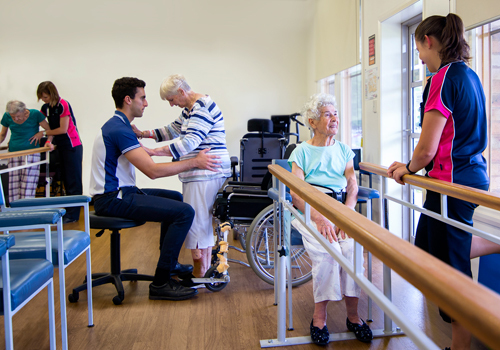 The Thomas Hogan Rehabilitation Centre (THRC) runs comprehensive rehabilitation and geriatric evaluations and supports people who have disabilities to achieve their independence. We work with you to ensure the therapy provided is suitable for your needs and enhances your recovery so that you can return home as soon as possible. A care coordinator will be assigned to you on admission and will be the primary contact for you and your family. Your care coordinator will ensure your therapy program meets your needs and any extra support is in place when you return home which may include referring you to external community agencies that offer services relevant to your situation. An individual therapy program including group and personal therapy sessions will be developed to help you achieve your goals and desired health outcomes. We encourage you or your next of kin/carer to ask questions about your care and raise any concerns with your care coordinator or nurse in charge. We believe that open visitation plays an important role in your recovery so visitors are welcome until 8.30pm in the evening, but it’s best to schedule visits when you are not having your therapy. You can spend time with your family and friends in or out of the ward and the types of activities you choose to do may depend on your medical condition. Please talk with a staff member before engaging in any activity. Please comply with any visitation restrictions recommended the THRC team. Can I bring food to the ward? If you have any concerns about diet, cultural or religious requirements please speak to the nurse in charge as there are rules about bringing food into the wards and we must meet food and safety standards (Food Standards Australia New Zealand). Are there private televisions available? Each bed has its own remote controlled television. These TVs are provided by an external service called HTR, charges apply. There is also a large communal TV is located in the lounge room. Can my pet come and visit me? We understand that your pet is part of your family and can be brought in for a visit at anytime but they must remain in the courtyard. What other facilities and services are available? Laundry – It is best for your family to arrange your laundry needs. We can arrange a private service, charges apply. Please bring all your prescribed current medications with you. These will be recorded and monitored by the nursing staff. Occasionally, the hospital may use the medication that you have brought in, but typically Northeast Health pharmacists will dispense your medication and the medical team will monitor your use. How long will I be in the rehabilitation program? The time you spend in rehabilitation will depend on your illness or injury. There is no set time for rehabilitation. A program will be developed based on your goals and your level of function. Your length of stay also depends on your progress and is reviewed regularly. We have a section on this website called Information for Patients & Visitors that provides more general information about the hospital and its facilities.